We offer custom contact lens fittings, including a trial period and room for adjustment until the perfect match is made. Drs. Blinstrup and Nuccio see that each individual patient’s needs are met, fitting from a wide range of daily and extended wear contact lens options. We also offer bifocal and color enhancement lenses. Talk to one of our doctors about what option might be best for you! 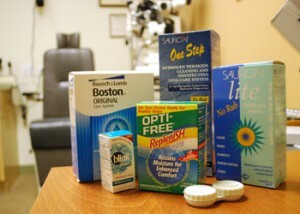 Contact lens solutions are also available at our office. Ask about Sauflon, a one-step cleaning and disinfecting lens care system. We now offer contact lens ordering online! New patients are welcome – anyone can order as long as you have a valid prescription that we will verify with your doctor. Available brands and prices are listed below. If you see the contact lenses you are looking for, create an account and you can order and have your contact lenses delivered to your door. If you don’t see them, contact our office and we will see what we can do to find them for you! Please call us with any questions you might have at 630.980.9095. You can also email us at nuccioopt@sbcglobal.net. *Orders can only be processed with a valid contact lens prescription that must be verified by your doctor. **Please note that online pricing may not match in-store pricing. Shipping for rebate eligible products in the amount listed is free when using USPS Priority Mail.